Sight Gag: English as a Second Language? Great shot. Would be nice to credit the photographer. The sight gag genre seems to me to be some kind of liminal species that, like the word “gag,” flicker between amusing and shocking. I keep going back and forth on how to read this photo. Fascinating. Spelling is the smallest part of a language, especially one with so many arcane rules that need changing. However, the photo is ironic none the less. This photo creates punctum because of the irony presented in the poster the lady is holding. Ronald Barthes uses the term punctum to indicate the aspect of the photograph that grabs our emotions or attention rather quickly. But also using Barthes’ term studium, it also plays a large role when viewing this photo. Studium helps to speak the truth about a photo in a direct way. Just by glancing at this photo, we get an image of a lady from Texas who, living in the USA, can’t spell correctly in the language she demands for to be the official language of her country. I am sure that this detail is unintentional, but as a perfectionist, I cannot turn away from this picture due to the message and its misspelled word. This photo shocks me and makes me wonder how people can be ignorant about what they stand for. 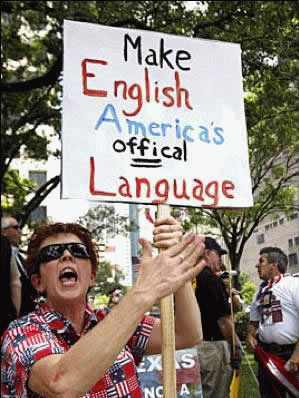 This affects me because, now that this photo is being circulated, what will people say or talk about, knowing that this woman demands that English should be the official language of America, but can’t spell in English herself? What would it say about our country?